By Admin in Resources on January 3, 2019 . 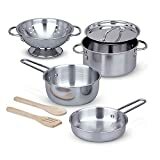 HAND-POLISHED STAINLESS STEEL: The Melissa & Doug Stainless Steel Pots & Pans Play Set for kids is an 8-piece stainless steel set including a colander, pot with lid, 2 pans, 2 wooden utensils, and rack. HIGH-QUALITY AND SAFE CONSTRUCTION: Designed with the highest safety standards, the riveted handles hold on tight, and thick stainless steel stands up to years of play. ESPECIALLY SIZED FOR KIDS: Our gleaming pots and pans would look great in any kitchen but have been sized specifically for kids. The included storage racks let children feel like real pros when they are cooking. GREAT GIFT FOR AGES 3-8: The Stainless Steel Pots & Pans Play Set for kids makes a great gift for kids ages 3 and up. Add the Melissa & Doug Kitchen Accessory Set to round out the hands-on, screen-free, pretend play cooking experience. “This play set features shiny stainless steel cookware Mom and Dad would envy! Generously sized (5-inch diameter) for a more realistic look and feel, the colander and three pans (with interchangeable lid) fit most play food items for exciting restaurant and kitchen play, and store neatly on a convenient storage rack when the kitchen is closed. All of the handles and knobs feature sturdy riveted joints that won’t weaken and wear like welding or glue. With two hardwood utensils included and stainless steel pieces polished to a gorgeous mirror-finish, this set is truly top shelf! We have made this 8-piece play kitchen set from superior materials that are dishwasher safe. The Stainless Steel Pots & Pans Play Set for kids makes a great gift for kids ages 3 and up. Add the Melissa & Doug Kitchen Accessory Set to provide children with another fun, screen-free play option. The Melissa & Doug kids pots and pans set includes 8 pieces: colander, pot with lid, 2 pans, 2 wooden utensils, and rack.